German beer gets all the credit, especially when Oktoberfest rolls around. But for those who’d rather sip a glass of wine than chug a one-litre stein, look up – way up – to Germany’s excellent vineyards. The best vineyards in Germany are perched precariously on cliffside river valleys. The Rhine Valley is the most famous, where some vineyards are too steep for tractors and vines must be tended and harvested by hand. These deep valleys reflect sunlight and heat off the water below up to the vines above, allowing grapes to ripen where they otherwise wouldn’t. White wine is king in Germany, comprising roughly two-thirds of the country’s total wine production. Of that, Riesling is the undisputed ruler in both quantity and quality, making up almost a quarter of Germany’s total wine production. Mller-Thurgau, Silvaner, Grauburgunder (Pinot Gris) and Weissburgunder (Pinot Blanc) are Germany’s other top whites. Germany’s top red grape is Spatburgunder (Pinot Noir), followed by Dornfelder and a handful of other, mainly indigenous, varieties. You probably won’t find much more than the odd bottle of German red around Alberta, though this is starting to change as Germany shifts more production to red wine. Older generations of Albertans know Germany as the home of Liebfraumilch and other cheap, cloyingly sweet bulk white wines that were (and still are) sold under labels like Black Tower and Blue Nun. Unfortunately, these made up the bulk of Germany’s wine exports for decades, giving German wine a bad reputation from which it is still recovering. 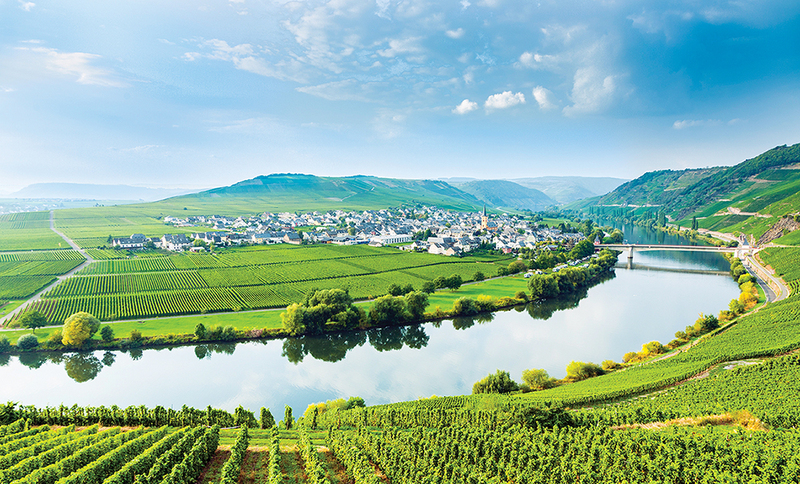 In Germany, Riesling attains a depth of character unlike anywhere else in the world. While the wines may be off-dry, sometimes even quite sweet, the best bottles are balanced by a zippy undercurrent of electric acidity. This makes German Riesling one of the most food-friendly wines in the world, pairing exceptionally well with all manner of cheeses – far better than the majority of red wines, despite what conventional wisdom may have you believe – as well as seafood, cream sauces, aromatic and spicy dishes. German Riesling is also one of the few white wines that can be aged, sometimes for as long as a decade or two. Aged Riesling loses its initial citrusy fruit characters in favour of a rich, oily texture and a distinctive note of petrol or vinyl (think gasoline or beach balls – and it’s really a lot better than it sounds). German wine labels may discourage English speakers and, admittedly, it takes a bit of practice to wrap your tongue around their multi-syllabic names. Key words to watch for are trocken, kabinett, sptlese and auslese, which describe the wine’s sweetness from dry to sweet, respectively.